Tomorrow, Saturday, February 8th, give your sweetie what he or she really wants: the chance to hand-feed a cow-nose ray. And a horseshoe crab. And a diamondback terrapin. The Maritime Aquarium at Norwalk is making the magic possible by putting a special twist on its popular behind-the-scenes “Feeding Time” program. On Sat., Feb. 9, the Aquarium is opening the program exclusively to couples age 18 and older, who will make the morning feeding rounds with staff prior to the Aquarium’s opening. “Valentine’s Feeding Time for Couples” starts at 8:30 a.m. 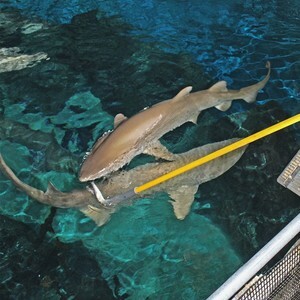 Participants will feel the vacuuming slurp of rays at the “Shark & Ray Touch Pool,” and go behind the scenes to hand-feed horseshoe crabs and diamondback terrapins. They’ll attend a private seal feeding by staff, and also visit the Aquarium’s “fish kitchen” where food is closely inspected and prepared.